Let’s talk about the cost. 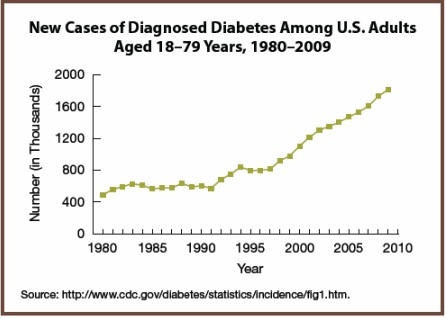 Total costs of diabetes in 2007: $174 billion. An average of $8,000 per person. Think about that number – $8,000!! If current trends continue, 1 in 3 Americans will develop diabetes by 2050 according to the CDC. When you consume a meal with sugar (glucose), the beta-cells of your pancreas release insulin (hormone). The insulin links up with glucose to get the sugar into the cells. Now imagine if a salesman came knocking at your door at 8 am, 10:30 am, 12 pm, 2:30 pm, 5 pm and 8 pm, day after day, week after week. You’d eventually stop answering the door, right? That’s what happens in the case of insulin resistance. The cell no longer “opens its door” to insulin creating excess insulin in your blood vessels. Since insulin can’t get into the cell, neither can glucose (sugar). Eventually, the beta cells of the pancreas die and are no longer able to release insulin. At this stage, people then need to use insulin injections to manage their blood sugar. Up until this point, you are able to increase your cell’s ability to “open its door” again by understanding what foods break down to glucose (sugar) and using specific nutrients to do so. This study discusses that when glucose is below toxic levels, the function of beta cells is restored. Yay! What foods are high in glucose? Think: refined carbs. Breads, pasta, cereal, toast, cupcakes, muffins, etc. This includes “healthy” whole grains. William Davis, MD and author of “Wheat Belly” states that 2 slices of whole wheat toast will spike your blood sugar more than a Snickers bar! Then you question, “but why does the American Diabetes Association recommend plenty of whole grains?” That’s a good question but I think the answer is clear. You won’t prevent or come out of Type 2 Diabetes with their recommendations. If I can’t eat grains, what should I eat? Some would call this “Paleo”. Here’s a great read on this way of eating reversing Type 2 Diabetes. “Practical Paleo” – my most used cookbook and lots of pics! “Primal Body, Primal Mind” – great analogies for food, exercise and more! Eat breakfast! Good source of protein, fat, and veggies if you can!